One of my favorite frivolous things that I own is a nicely articulated and splendidly dressed doll of Joshua Chamberlain as a Union general (replete with weapons, etc.) in full dress uniform. 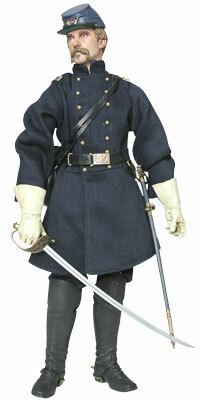 This doll was part of the Civil War themed "Brotherhood of Arms" series created by Sideshow Collectibles. I acquired mine after the doll was already sold out, and knowing how toys can appreciate in value when cared for and kept in a pristine condition, I made the decision to leave him in the box, tethered with plastic-covered wires to his cardboard backing. Really, this is no life for a toy. While it is debatable that Sideshow Collectibles ever intended anyone to "play with" these dolls (the name of the company implies a sort of "hoard and save" sensibility), the thing is articulated for a reason: so that it can move, be posed, have its clothes rearranged, removed, etc. Granted, I bought this doll as an adult and my sense of "play" these days is mostly confined to sitting dolls around in postures as though they are chatting it up, then forgetting them except to dust them from time to time. But I have several other dolls from this series and at least they made it out of the box! And that's my roundabout response to what paper dolls are "for". While I do have a few (a very very few) duplicate copies of favorite paper doll sets, I am not a collector in the sense of someone who expects to store and save and eventually pass down or profit from my paper dolls. To my way of thinking, paper dolls were made for the purpose of playing with and I love the therapeutic/meditative quality of liberating the clothing from the page. I tend not to cut out the dolls themselves (as opposed to their clothing) sometimes ~ mostly because they don't need to be cut in order for you to lay the clothing over the top ~ but for sets with a lot of hats and hairdos or really simple shapes, I will generally cut out the doll. I have not counted or cataloged the sets I own (that's part of what this site is for! ), but I estimate I have acquired (over the last 20 years) more than a hundred sets of a fairly broad variety. Thematically most of them are (you guessed it) 19th century styles. If I were to say I collect any one thing, it would be paper dolls depicting clothing specifically from the Civil War. I do not own or collect actual 19th century dolls (created in that century). I have neither the money nor the inclination. I do, however, collect 19th century photographs and since photographs include clothing, I hope, from time to time, to share items out of that collection. Update: Last year (2013), I sold my Joshua Chamberlain doll to a collector who was eager to enjoy and appreciate him as intended. I was sorry to see him go, but very happy that he found a new home with someone who (maybe) will be willing to take him out of the box.